I’m focusing on overview, the differences between SfB Server 2015 and SfB Server 2019 and documentation as i find more ill add to this post. From documentation side it seems Microsoft are using shared documentation between SfB Server 2015 and 2019 where possible and there are several highlights for 2019 but ive spotted a few mistakes and raised them. Withe removal of Exchange UM in Exchange Server 2019 you now can connect SfB Server 2019 to previous versions of Exchange UM but not Exchange Server 2019 as UM is not there anymore. Its use Cloud Voicemail (Azure Voicemail) so in SfB Server you set up hosted voicemail very similar to hosted voicemail with Exchange Online UM before. Call Data connector we can view call monitoring info for On premises and online users in one place which is nice but you need hybrid and for all these new feature you need hybrid so its a step in the path to the cloud with SfBS 2019. Side-by-Side Migration is nothing new and was a supported method back since OCS to Lync 2010 and was the only method untill SfB Server 2015 which brought us in place upgrades but thats also been removed in SfB Server 2019 below. Move-CsUser -Identity user0 -Target sipfed.online.lync.com -moveToTeams -credentials $cred. To be honest i wont miss XMPP as in my experience i never deployed it for customer and as google moved away from it there was less use for it, P Chat i thought would be removed as we have Teams but for existing P Chat users there isnt a way to simply migrate from P Chat to Teams. SQL Mirroring was a popular method of SQL HA but Microsoft have said for a long time this will be deprecated from SQL so no real surprise and with no inplace upgrades you will be setting up new SQL anyway so you have SQL AlwaysOn Clustering and Availability Groups for SQL in SfB Server 2019. In Place upgrades were a good thought and did reduce the need to buy new hardware and by side by side migrations i did some of these and there was usually something that needs tweaking so im not sad to see this go. Buy new hardware and start a fresh and dont bring old crap with you lol. UCWA is here and the legacy Mcx service used by legacy clients wont be used so legacy clients cant connect to SfB Server 2019. You need to have Hybrid to take advantages of the new bells and whistles in SfB Server 2019 and also will ease migrations to SfBO or Teams. Standard Edition is still here ! and brought back by demand of the community ! Enterprise Edition – you can have one or more (ideally at least three) so the recommendation on three is still valid in a fashion i would think due to windows fabric and the power of three FE’s enables more features like lazy rewrites to SQL and you take advantage of Windows Fabric. Here it mentions “We do not recommend deploying a Front End pool that contains only two Front End Servers.” “If you want to deploy just one or two servers running Skype for Business Server, we recommend you deploy them as Standard Edition servers.” so for HA guidance is still at least 3 FE’s it seems. SBAs and SBS’s – are here and SBS are mentioned running SfB Server only so not sure if Lync Server is supported but i think perhaps not. not sure on this. Edge Servers, Directors, Mediation etc all here. Surprised to still see VIS role tbh. Standard Editions need dual 6 core processors and 32GB RAM. Enterprise Edition we need dual 6 core processors BUT 64GB RAM per EE Front End and Back End Servers !! thats double the memory from SfB Server 2015! ONLY Windows Server 2016 ! SQL Clustering and SQL Always On still supported but Mirroring is gone! NOT the same as SfB Server 2015 as that supported down to Windows Server 2003 probably due to inplace upgrades as thats what Lync Server 2013 supported. So you need to be on at least Windows Server 2012 forest and domain functional level for SfB Server 2019! No mention of Lync Phone Edition or LRS but i imagine TLS 1.0 is disabled. 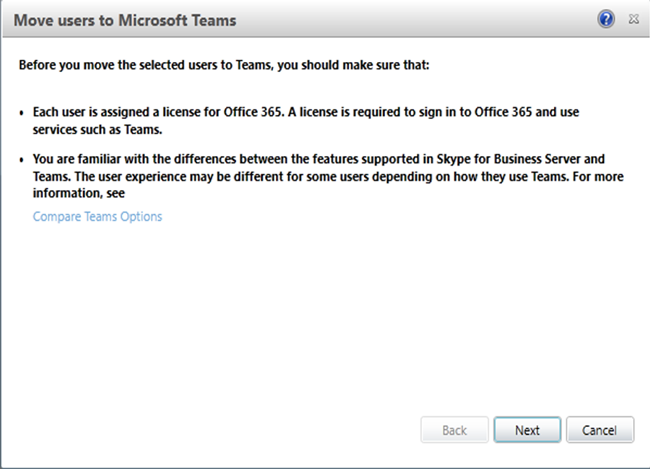 In general Skype for Business does NOT plan on shipping new features in the Skype for Business MSI after its initial release. MSI improvements between releases will primarily be quality/security in nature. The latest and greatest Skype for Business client experience will be found in the Skype for Business 2019 click-to-run installer. Funny i think under Legacy clients it mentions Lync 2013 is supported. hmmm confusing. Skype for Business Server 2019 and Skype for Business Online support the following previously released clients: Skype for Business 2016, Skype for Business 2015, Lync 2013. Same as SfB Server 2015 with Enterprise Edition and Server Pooling. Front End Pools for HA are still recommended it seem to have at least three FE’s. anything smaller recommendation is to deploy Standard Edition. Enterprise Edition pools can be paired only with other Enterprise Edition pools. Similarly, Standard Edition pools can be paired only with other Standard Edition pools. Physical pools can be paired only with other physical pools. Similarly, virtual pools can be paired only with other virtual pools. Pools that are paired together must be running the same base operating system. Its believed in the Community that the CMS failover bug with standard edition is resolved in SfB Server 2019 as well ! Seems to be the same as SfB Server 2015 although an Enterprise Edition Front End needs double the memory and now 64Gb of RAM.